Archidex 2009 and IPMEX 2009 were just over. Both of these exhibitions were the major events for the large format printer (LFP) industry. Archidex 2009 is one the biggest event for the CAD plotters while IPMEX 2009 is more related to the large format printing application in graphic arts and color matching sectors. During these shows, the LFP exhibitors received tremendous comments from large format printer users about the availability issue of the supplies and spare parts of 2 major LFP brand in Malaysia namely HP and Canon. 1. Long lead time for certain HP Designjet replacement parts. 2. Users have no idea where to look up for ready stock of Canon imagePROGRAF (iPF) supplies like ink tanks and maintenance cartridges. The remark on the HP Designjet for long lead time on spare parts may subject to a lot of argument as HP is one of the most established brand in wide format printer market. Those users who made such comments may own a long phased out models which purchased more than 7 or 8 years ago. As for the query on where to get ready stock of ink tanks and supplies for Canon imagePROGRAF printer, we have got the answer here. 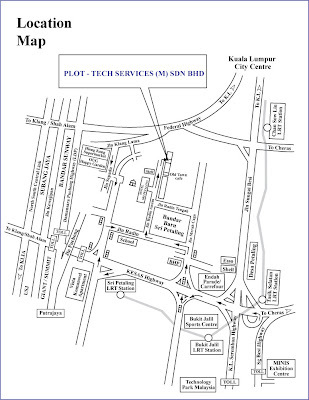 Plot-tech Services (M) Sdn Bhd which is situated in Kuala Lumpur is the one-stop centre for Canon imagePROGRAF large format printer consumables and supplies. If the users are looking for any particular consumable item of Canon large format printer be it a ink tanks, maintenance catridge or print head, Plot-tech Services (M) Sdn Bhd would be an answer for the urgency. Pictures below are taken from the retail front of Plot-tech Services (M) Sdn Bhd. PF-03 printhead for Canon iPF series, PFI-102 for Canon iPF500/510/600/610/700/710 and PFI-701 ink tanks for Canon iPF8000/8100/8000s/9000/9100/9000s. PFI-301 for Canon iPF8000/8100/8000s/9000/9100/9000s, PFI-302 ink tanks for Canon iPF8000/8100/9000/9100, PFI-102 ink tanks for iPF500/510/600/610/700/710 and BCI-14X1 ink tanks for Canon W series LFP. PFI-703 ink tanks for Canon iPF810/820. PFI-101 ink tanks for Canon iPF5000/5100/6000/6100/6000s and PFI-103 ink tanks for Canon iPF5100/6100. Maintenance cartridges for Canon iPF series. James Khor, the Managing Director of Plot-tech Services (M) Sdn Bhd has commented that the company is keeping buffer stock of 2.5 months to cater for the needs of Canon imagePROGRAF LFP users across the country.